I'm stoked for 2017 – for us AND for our customers. 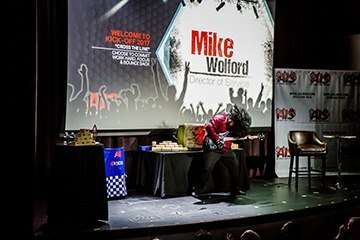 On February 3rd, nearly the entire company came together to celebrate a successful 2016 and to kick off an even better 2017. 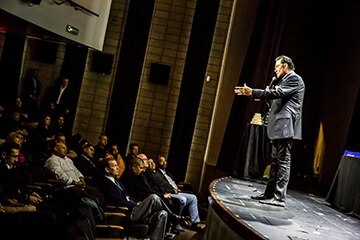 We held our event at the Inspire Theatre in downtown Las Vegas. As you'll see in the photos below, we had a good time. Our theme for this year is Cross the Line. In all that we do providing office equipment and services (digital copiers, printers, scanners, and production printing), VoIP telephone systems, managed IT services, and 3D printing services and printers for small and medium businesses who understand the value of technology; our goal is to cross the line for us and for you. Like any company, we have internal growth goals too! Of course, to reach those goals and cross our line we'll continue our focus – as we have from the beginning – of “crossing the line” for our customers with the right technology matched to their (your) unique business challenges, needs, and goals. We succeed and cross the line when you do. Our mission as a Company is to “Exceed our customers’ expectations by providing unparalleled business solutions with leading edge technology products, coupled with unmatched service, supplies and support. Our foundation of work ethic, integrity and teamwork enable us to work within a culture that cares about our customers, our community and each other. For those of you who've known AIS for years, you know how strong we are in providing managed print services and office equipment (for sale or lease). And that will continue to be an important part of our business. But, as you've no doubt noticed, we added managed IT services to our product and services portfolio last year. As more and more small businesses need help meeting their IT needs with internal staffing, our network management, backup, and virtual CIO strategic planning support will deliver IT capabilities to these businesses that they couldn't afford on their own. With our first year under our belt, we'll be focusing on tightening our internal processes so that we can streamline how we serve all of you. Though our partnership with one of the leading document management software providers, DocuWare, we're going to focus on being even MORE of a one-stop-shop for your IT needs. There has always been a disconnect between companies and their technology providers. Customers would have multiple vendors for copiers, printers, IT infrastructure (like networks and backup), ERP, and document management and workflow to operate their businesses. 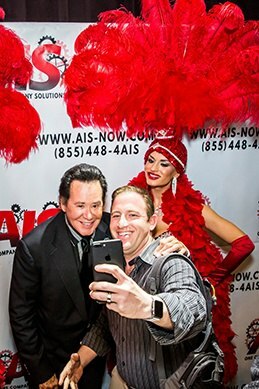 AIS is uniquely positioned to give our clients what they really seek, one company, many solutions to manage all of their technology needs. Our processes give us the ability to understand our clients’ workflows, mission-critical documents, processes, IT infrastructure, and document life-cycle enables us to offer a complete solution that integrates their various technologies to work together through integration rather than standalone offerings that don’t meet our customers’ overall needs. Through applications, software and cloud offerings provides our customers the convenience managing their information/documents more effectively. AIS has surpassed 1 billion prints-that means that out of all the prints made on copiers serviced and maintained by AIS, over 1 billion prints were registered in 2016. Officially a three coma club year!! We will open a new central warehouse location in California to give better access to service team for parts and equipment set up and delivery. This will mean even faster response times to clients in California. AIS has set a goal of giving back 300 hours of Volunteer time off in 2017 to serve our local communities. 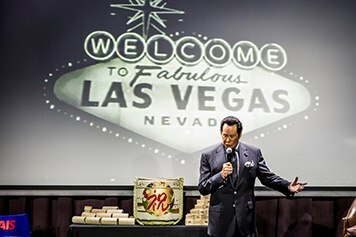 $1 million dollar technology remodel of AIS Headquarters that will soon be finished – we're looking forward to being able to share a high-end technology center and showroom for our Las Vegas customers. We're planning a 15 year anniversary celebration. 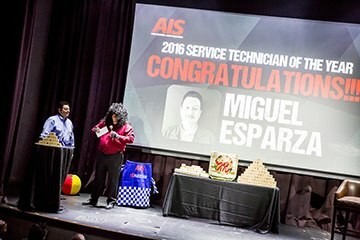 Launched a recognition platform internally so that all AIS employees can recognize the efforts of their peers. When buying or leasing a digital copier and/or printer, the equipment is (in some ways) the least important part. You need a partner who can effectively service those machines so that when they break (and they will), your partner will get you operational again ASAP. We guarantee responsiveness and quick resolution! Our competitors say they’ll be there in 4 hours or less. Well in less time than that, we will have your device back up and running. In 2016 we completed 24,517 service calls, of those calls, 74% were responded to and repaired in less than two hours. 92% of those calls resolved and completed in 1 visit. We guarantee quick resolution because we stock 12K supplies in each tech vehicle, 51+ certifications per technician, 120 days of stock inventory, 5.2 million supplies & equipment in stock, and 30+ factory trained technicians. Of all the invoices sent by AIS, only 1.5 generated any type of question at all-that means 98.5% accurate invoices. Why should you care about these stats? They mean productivity for our customers. Why's Gary in a Skirt? To announce the incentive trip for this year I decided to have a little fun. 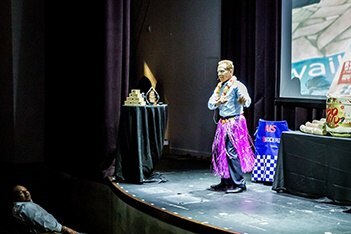 Dressed like a slightly tipsy Magnum P.I., I threw some beach balls out for everyone to announce that the reward for successful AIS team members this year is a trip to Maui. We were lucky enough to be joined by Kyocera Document Solutions Americas President Yukio Ikeda and also Great America Company executives. 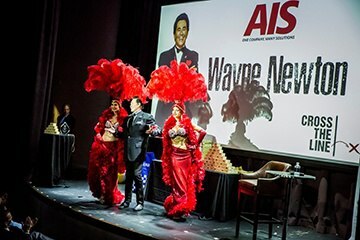 The Keynote speaker of the night was kept a secret until he was introduced onstage-Mr. Las Vegas himself, Wayne Newton escorted onstage by beautiful Las Vegas style showgirls dressed in red garb in the spirit of AIS company colors. 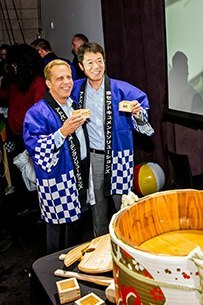 We concluded our annual meeting with an AIS tradition – a Kagami-Biraki ceremony That's a sake barrel opening ceremony. 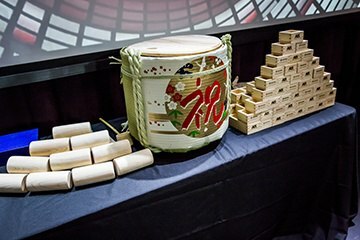 You'd think we'd be good at it by now, but after whacking the top of the barrel with mallets we managed to spray sake everywhere! 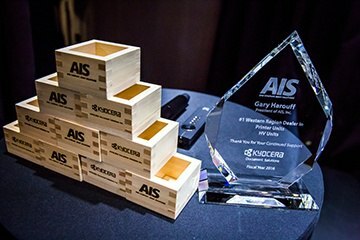 We toasted to the future of AIS in 2017. 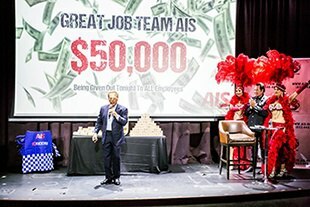 Then it was my pleasure to announce (and judging by the smiles, the audience liked it too) that we'd be sharing out a bonus of $50K to our employees. Once again, for all of you reading this who are our customers – THANK YOU! We had a great 2016 and 2017 is already off to a great start. Let's cross the line for fantastic business solutions together. 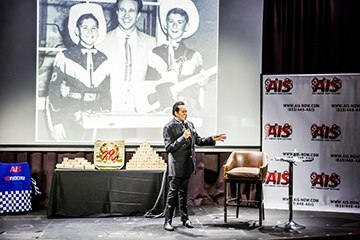 I'll leave you with a few photos from our kick off event – including Mr. Las Vegas, Wayne Newton!